The Supporters Clubs World Confederation, the entity that encompasses the penyes movement of FC Barcelona, will hold its XXXVIII Global Congress from 5 to 7 August. The registration process for the activities is opened since Monday 10 July. 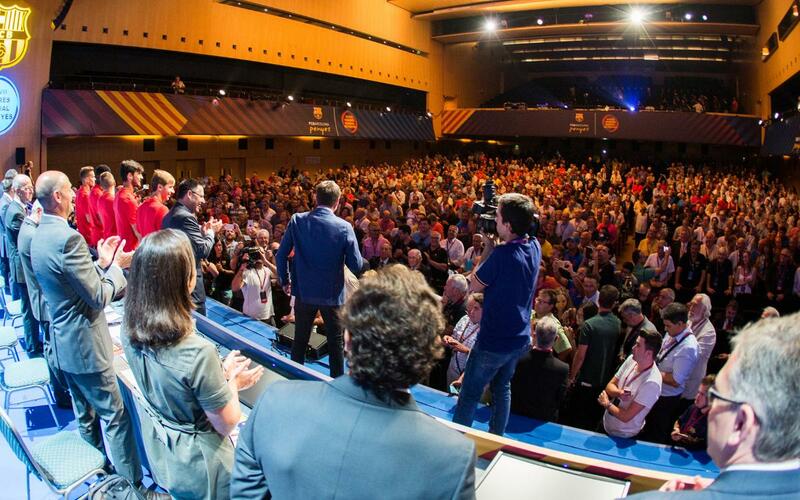 The most important date of the meeting, the institutional event organised jointly by the Confederation and FC Barcelona, will take place during 7 August at the Palau de Congressos Internacional de Catalunya with the presence president Josep Maria Bartomeu, other directors and president of the Supporters Clubs Confederation, Antoni Guil. Before that, during 5 and 6 August, the traditional Football 7s tournament will take place, and the popular dinner at the Camp Nou facilities. The Confederation is also hosting, for another year, the Penyes Futbol Games with Pro Evolution Soccer 2017 (PES 2017) as the protagonist, by Konami, sponsor of FC Barcelona and the Supporters Clubs World Confederation. "After presenting the Penyes Segle XXI programme last year, we want to demonstrate the strength of this supporters club project with a series of activities which aim to open the penyes to the world," said Antoni Guil, president of the entity. On an annual basis, the event serves as a meeting point for the penyes movement. In its XXXVIII edition the attendance of more than 1,300 supporters clubs is expected. To attend as a congressman or invited to the institutional conference day you should contact to your respective Federation.